A persona is a fictitious person we use to represent a larger audience. 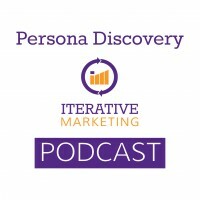 Personas make up the second actionable component of Iterative Marketing. When a persona is documented, it creates shared vocabulary among multiple departments in the organization and with external vendors. Organizations can target multiple personas with the goal of corresponding each piece of marketing collateral to one of those personas.